Hyundai Matrix is ​​a subcompact for Korean company Hyundai. In Japan, South Korea and Taiwan it was sold as Hyundai Lavita, in Australia as Hyundai Elantra Lavita, in Malaysia as Inokom Matrix. In April 2001, a car with the code name FC (Family Concept) was introduced to Auto Mobil International in Leipzig. It was developed in Turkey for Europe. The design of the car was developed by the Italian company Pininfarina. The interior with five seats has folding backrests of seats that can be moved and adjusted their angle of inclination. The only available level of GLS equipment comes standard with four airbags, ABS with electronic brake force distribution, belt tensioners and height-adjustable rear headrests. 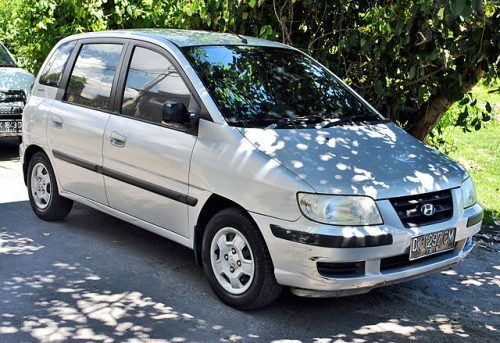 At the time of launch in August 2001, Matrix has two petrol engines and since September 2001 also diesel. In 2003, a special version of the 1.6 GLS Edition + was introduced, which also included air conditioning, an on-board computer, remote central locking of doors, 15-inch alloy wheels and metallic paint. In the fall of 2005, a restyling option was introduced. The radiator grille, front bumper and taillights were changed. So the old diesel engine with 3 cylinders was replaced with a new 4-cylinder engine with a power of 75 kW (102 hp). In March 2008, the second edition of the Hyundai Matrix was introduced at the Geneva Motor Show. The front end of the car, which was made similar to the Hyundai i10, underwent the greatest changes. Also there were new wheels, the ledge under the rear side window made less noticeable, the interior changed slightly.